IBC's newest generation combination barcode/magstripe reader for connecting to PCs and controllers. The Magbar Jx is user programmable and firmware upgradeable, allowing new features to be added in the field. 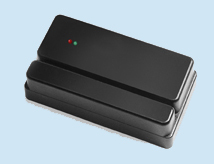 The Magbar Jx is a decoded combination barcode and magnetic stripe swipe reader, designed to be used in any application which requires the swiping of a barcode from a card, such as employee IDs, temporary badges, and driver's licenses. The Magbr Jx readers are available in a wide array of industry standard interfaces, are programmable, and may be ordered with a variety of options, such as leds, alphanumeric displays, sense inputs, and relays. Perfect for use in Access Control and Time & Attendance applications. The Magbar Jx is firmware upgradeable, and can read and process Kronos, Cac, Usid, Dbids barcodes, and Aamva driver's licenses.